Event Alert: Mahindra Satyam faces the global services industry - the bleeding has stopped, but can it regain its Tier 1 India provider status? Mahindra Satyam recently staged it first analyst conference as a new entity, to announce to industry that its new structure was complete, and was a serious IT/BPO services competitor. Resurrecting itself from the biggest scandal in Indian outsourcing history, a renamed Mahindra Satyam has quietly been going about its business to rebuild trust and confidence in the firm. 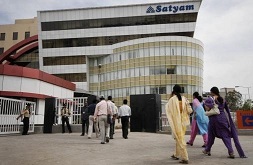 In the last year, it expanded business with the base of Satyam customers that remained with the company, despite the scandal, with 54 new customer contracts, although several of these are relatively small-scale engagements. It has also formed a new senior management team by injecting some Tech Mahindra leadership, in addition to hiring liberally from its competitors. This new blood joins the existing Satyam leadership that weathered the storm to form an energized and dynamic leadership team. Noticeably absent was much of the sales glitz that Satyam was famous in the Raju days, with the presentations communicating a more down-to-earth and fact-based approach to services, indicating the engineers are now in charge. The team was quick to point out that Deloitte has been retained as the new auditor (Satyam was previously using PwC), with KPMG performing the detailed work on restating the financials, which are scheduled be completed by July. Clearly, the newly merged provider is trying hard to clear the air and start on a new footing, firmly based on solid metrics and hard facts. All of the employees were very much “on message” that most of its critical staff and clients stayed with them throughout this problem period, despite a few notable terminations, for example, State Farm Insurance. There weren’t a lot of auditable facts to back up that claim, but clearly most of the employees and clients that remain at Satyam are there because they wanted to be. There were also representatives from five clients at the conference, all of which had glowing things to say about the company and the service they had received without interruptions. This is consistent with our experience from the crisis days, when many customers were happy with their service provision, and opted against contract termination, despite having the opportunity to do so. Satyam Mahindra does not yet have very clear messaging regarding its competitive differentiation, but it did push its strategy that it is highly proficient in enabling the mobile enterprise. This dovetails well with Tech Mahindra’s expertise in the telecomm vertical and will allow it to expand into other industries , where enterprise mobility is becoming increasingly important. This will be a powerful differentiator, as the enterprise becomes more and more distributed, provided the firm can demonstrate real client success in mobility. It also showcased its Bridge Consulting acquisition, made in January 2008, emphasizing how management consulting is now a standard capability through which it intends to lead client engagements, as opposed to positioning it as a specialist offering, such as HCL’s positioning of its acquisition of SAP implementer Axon. This is concerning, since the industry has several examples of other firms that have struggled with a similar strategy, such as EDS with its acquisition of AT Kearney, or the IBM with PWC Consulting. Mahindra Satyam will have to solve the problem of having Bridge recommend its clients increase its investments with Mahindra Satyam without losing its perceived objectivity. The three industries it has chosen to concentrate on are BFSI, Telecomm, and Manufacturing, but it also has a unit concentrating on a conglomerate of CPG, Retail Travel, and Logistics. The horizontals are the IT basics of infrastructure and applications, a unit looking at Integrated Enterprise Business Solutions, and Engineering Services which includes programming for imbedded devices. 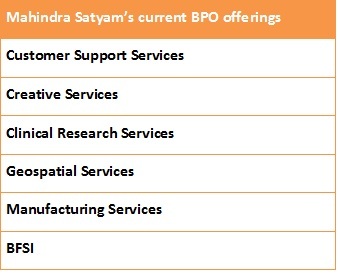 With regards to BPO, Mahindra Satyam has selected six offerings where it has domain experience, developed offerings and IP, and a competitive position in the market. It is noticeably gaining some traction, for example, creating and delivering knowledge process services, where it has been performing some notably commendable KPO work with global pharma giant GSK. This is in addition to other KPO services it currently delivers to many of its current IT clients, as adjunct service offerings. HfS Research believes this is a sensible strategy for the interim, as several of the newer BPO entrants are struggling to compete on horizontal BPO services with the likes of Accenture, Capgemini, Genpact and IBM. Focusing on KPO work, and some specific vertlcal BPO is clearly a smarter move, as Mahindra Satyam consolidates its position in the market. The main issue that seem to be of interest to many people, is what Mahindra Satyam has to achieve to return to the ranks of the Indian tier one IT services suppliers , namely Cognizant, HCL, Infosys, TCS, and Wipro. We believe Mahindra Satyam runs the risk of getting stuck as second tier to these companies if it follows the crowd and attempts to replicate very similar offerings to its larger competitors, without genuine differentiation, beyond operational capability. It needs to convince customers of its culture and distinctiveness in areas it already has real credibility (for example enterprise mobility, BFSI and life sciences), and how it has harnessed these capabilities to venture into related functions and markets where the firm seeks to gain a foothold. Currently, the signs are encouraging for the firm: it has not only stemmed, but stopped the bleeding, and stabilized the very serious situation that threatened the future of the whole Indian offshore industry - and not only Satyam’s. It has decided to concentrate on the functions and industries where it has valuable domain knowledge and IP, and the enterprise mobility theme has real potential whereby to differentiate itself. What it must do now is develop its sales, marketing, and customer interface functions with the same intensity that is has placed on delivery and operations. Beyond that, it will eventually have to move into the horizontal G&A BPO areas if they are going to get invited to the bigger multifunction deals, which will necessitate future acquisitions and partnerships. All-in-all, the signs are encouraging, but this is only the start of a long journey to establish the newly merged provider. Does it make a difference if they are making money and have higher levels of ROI??? I am still waiting for some buyer who will share with me a delivery failure from Satyam... thus far to case examples! This is a very timely post from Phil. Both from the timing of the rebranding and the prevailing market conditions. All their competitors are offering "me-too" services. Differentiating from the pack and leading once again should be the mantra. We are looking to see how other analysts rate MSatyam and more importantly - how the Clients rate them.